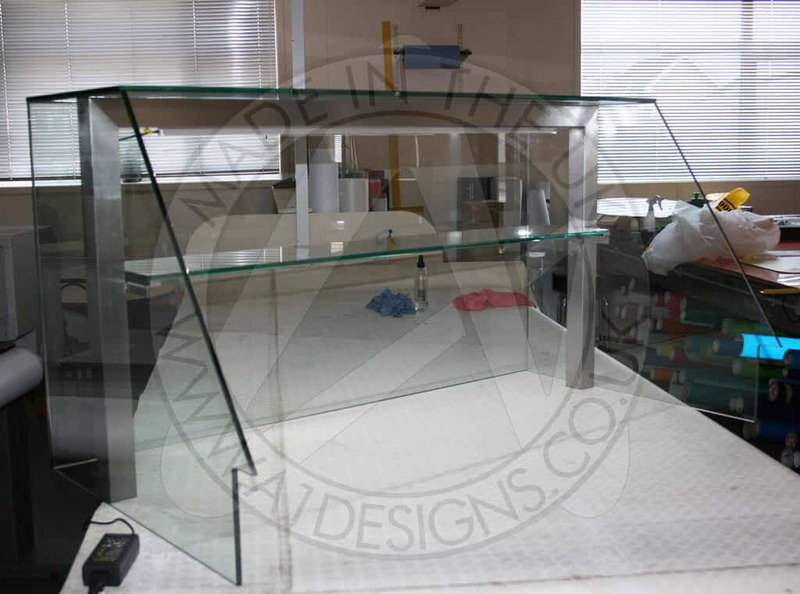 UV Bonded Bespoke Display Cabinets allow a custom designed cabinet to be made that enhances the products you want to show within it. From food through to jewellery the sleek feel with clean lines and crystal clear bonds, will show you product off to its best. Through the use of UV Cured adhesives, bespoke display cabinets manufactured from glass alone is now possible. With the added ability to adhere glass to metal, wood and marble, a wide range of fixtures and fitting can be used to create a truly bespoke display cabinet that fits your needs. Bespoke display cabinets are a new service A1deSIGNS is providing. The bespoke display cabinets are made from toughened glass and involve the process of UV Bonding the glass together along with various fittings. The bond when fully cured is stronger than the toughened glass itself. The bespoke glass cabinets service has been put into place to complement both our cold cathode lighting service and our signage service including the use of vinyl graphics to enhance the fronts of cabinets, in a way that we hope will help us bring glass, signage and lighting together, creating stunning effects. Do not place very hot or very cold items on the glass surface(s) unless adequately thick mats are used to prevent such items from coming into contact with the glass. When cleaning glass panels use a damp cloth or leather with washing up liquid or soft soap if necessary. Do not use washing powders or any other substances containing abrasives since these substances scratch glass.